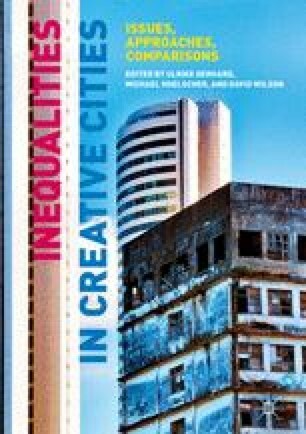 In this chapter I explore the ways in which both the idealized representations and the material composition of the creative industries’ labor forces exclude multiple ‘Others’, including many women, working class men, people of color, and the majority of in-migrants to the UK. In the first part of the chapter, I explore the critiques of arguments about creativity, the rise of knowledge economy, the mobility paradigm, the identification of a ‘new’ capitalism, and the Italian Operismo School’s predictions. I then turn to a case study of Oxford: a city that perhaps above others in Britain, with the exceptions of London and Cambridge, personifies a ‘knowledge economy’. In Oxford, ‘brain work’ is the key activity of many employees. It is also an unequal city with a ‘dark side’ that is seldom part of the idealized representations. CBI. 2014. The creative industries: a growth strategy for the UK’s creative industries. Available from www.cbi.org.uk/business-issues/creative-industries.